With self-driving trucks being actively developed, it’s worth taking a look at the impact they may potentially have on the logistics industry once deployed. Recently, there has been a lot of talk about the future of automated driving and how companies are investing heavily into pioneering and perfecting this technology. Those of us in the logistics industry, in particular, have been considering how automation will affect the way we do our jobs. An oft-quoted statistic has robots taking over nearly 40% of all jobs over the next 20 years. In our industry, however, self-driving trucks could be more of a blessing than in other areas, especially due to the current shortage of drivers and other problems that have been affecting transportation over the last several years. How exactly will self-driving trucks revolutionize the industry? Most of it has to do not with the technology itself, but with the methods we use to get cargo from place to place quickly. Many commentators are worried that self-driving trucks will force humans out of jobs, but technology and transportation firms actually envision a future where automation complements human drivers. It’s no secret that self-driving technology has its growing pains – one of the major problems has been the differences between city and highway driving and how the technology is able to cope with changing conditions. However, transportation companies see an opportunity here – because highway driving is rather standardized and easier than driving in an urban environment, the proposal is to have self-driving trucks move cargo on the highways between major metropolitan areas and enlist human drivers to pick up from there to get the trucks to their final destinations. Within the industry, this is known as the “transfer hub” model. Transfer hubs can be strategically located so that self-driving trucks can haul cargo on the freeway system for long distances, stop at a hub close to the final destination, and swap trailers with a truck that is being driven by a local driver. While it may not seem like it at first glance, this puts the bulk of the work still squarely in the hands of human drivers – self-driving trucks would only have the latitude to function on the narrow scale of freeways. It could potentially alleviate the current driver shortage problem that is only expected to get worse as time passes. It can also create better working conditions for the drivers themselves by eliminating the need for them to travel long distances over the freeway system. While many in the tech and transportation fields are looking at the transfer hub model as a major innovation worth exploring as self-driving trucks are adopted, there are other ideas that are being pursued as well. One potential innovation could be a concept known as “teleoperation”, which would allow a driver to control a self-driving truck from a remote location. This is similar to the way unarmed aerial vehicles (known popularly as drones) are operated and would allow professionals to take control of a vehicle if the need arises. Another idea being floated in the industry is the creation of trucking convoys with both autonomous as well as manned trucks. No matter how the transportation industry decides to integrate automation into their fleets, it’s worth considering the primary challenge that has to be addressed. The current driver shortage will only get worse as time goes on, especially if current driver turnover rates stay high. 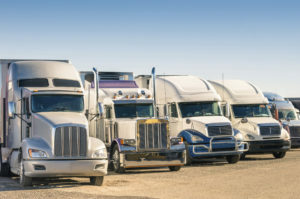 Autonomous vehicles may be able to help, and the business that figures out how to best integrate automation with traditional trucking practices will be able to navigate the impending new era in the transportation industry. This entry was posted on Friday, August 3rd, 2018	at 10:22 am	and is filed under News	. You can follow any responses to this entry through the RSS 2.0	feed. Both comments and pings are currently closed.